With Easter Sunday this week, and before we all start munching on chocolate eggs, I thought I'd write a blog post about chocolate and microbiology. In 1824 a certain 'John Cadbury' opened a small confectionery shop in Birmingham that, as well as chocolate, served tea and coffee. From its humble beginnings on Bull street in Birmingham, this purple giant chocolate company has grown to be one of the largest confectionery producers in the UK. However, (the chocolate horror story begins!) In June 2006 Cadbury's withdrew a million chocolate bars. This was not because the employees fancied having all the chocolate to themselves BUT was due to fears of them being contaminated with a rare strain of Salmonella (BBC News 24/6/2006)! How could this have happened? and what is this 'rare' Salmonella? 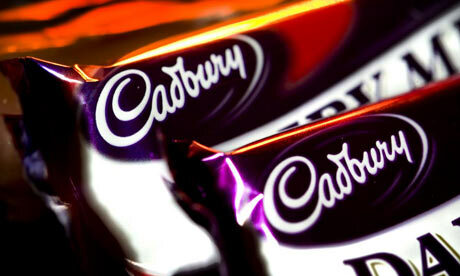 Cadbury's withdrew the chocolate bars as a precautionary measure due to a leaking pipe at a Cadbury's plant being the potential source according to the Health Protection Agency (HPA) who identified the bacterium. This leaking pipe could have contaminated the products causing Cadbury's to react to the situation. Cadbury's reacted like this as there is NO safe level for Salmonella in chocolate due to low numbers of the organism being capable of causing severe disease. "The 'fat' in chocolate can also protect the bacterium from normal intestinal defences" - Prof. Hugh Pennington (Aberdeen University). The 'montevideo' strain of Salmonella found is very rare and not one of the top 3 most common strains in the UK. It causes Salmonellosis or 'severe food poisoning' (abdominal cramps, diarrhoea, vomiting etc.) in individuals and can be fatal in young children or the elderly due to dehydration and salt loss. However, most cases usually resolve in 4-7 days. There you go, it's not just chicken, eggs and beef which can potentially cause food poisoning - most foods can! All it takes is one bacterium to make its way in to the food process and outbreaks can occur. This story shows how well the food industry responds to potentially contaminated products. Precautionary measures are always best when it comes to potential food poisoning outbreaks and Cadbury's acted responsibly in order to protect consumers.